Exhibition opening event & Artist talk, 6.30-9pm, 1 November in the Library. Refreshments served. All welcome. An exhibition of work by Anita Strasser. 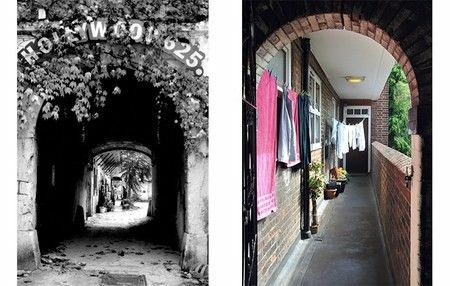 This exhibition features the work of two projects which set out to facilitate community networks and social cohesion in two different neighbourhoods. Where the documentation of life in a hidden courtyard in Slovenia's capital Ljubljana resulted in an outdoor exhibition / party - organised by the local community so neighbours could meet and share their stories, the action research-based participatory project in a block of flats in Deptford, south-east London, engaged neighbours in building up a shared dialogue through repeated collective activity such as beautifying communal spaces. Both projects involved the use of photography as a researching tool, with the understanding that the process of collaborative image-making and the sharing and gifting of generated research material has the potential to develop the visceral experience of community such as trust, familiarity and belonging. The repeated encounters with neighbours generated through this participatory process helped facilitate recognition, small-talk and regular contact among some, overall resulting in, as neighbours have commented, 'feeling better about living here'. Artist / Speaker: Anita Strasser.